Posted on April 18th, 2019 in Dee Why. Perfect conditions again, but still only a hint of swell. The 1.84 m high tide at 0715 was swamping Dee Why, but it hardly mattered as the swell was trickling in at maybe waist high on the big ones up the beach. Nothing was going on at the point. Wind was lightly from the NW and the MHL data from 0500 was showing a metre from the east at 8 seconds. Should be a mostly sunny day, with a high of 26. On the road shortly, so stay tuned for postcards! Variable about 10 knots becoming east to northeasterly 10 to 15 knots in the late afternoon then shifting southerly in the evening. Southerly 10 to 15 knots becoming variable about 10 knots in the morning. Partly cloudy. The chance of a thunderstorm. Northeasterly below 10 knots increasing to 10 to 15 knots during the afternoon. Posted on April 17th, 2019 in Dee Why. Mostly clear skies as Wednesday fired up along the beaches. Happily it looks as though we have a little more wave energy than yesterday – which isn’t saying much, because it was basically flat. A few bods scattered among the beach break peaklets as of 0700. From what I saw, I’d say it’s in the ankle to knee high range with the odd plus. Wind was light westerly early. It should swing more to the east but not kick up too hard later. The MHL buoy was showing a metre of 7-sec wind bump from the ESE as of 0500. First tide of the day was a deepish 1.8m high at 0620. There’s a slight chance of a passing shower during the day. We’re heading to a high of 25C and ocean temp is sitting on 20C. 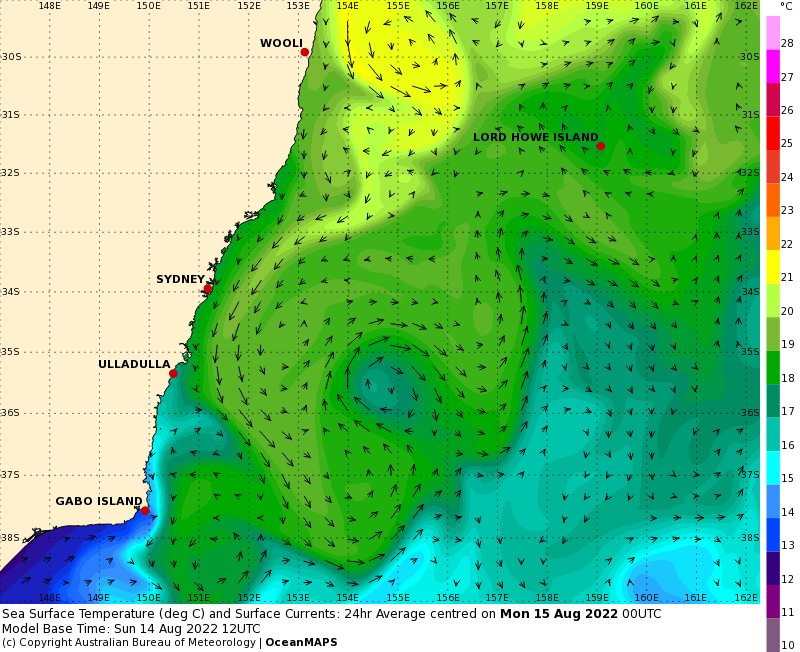 Outlook is for wave energy to increase just a tiny bit over the next couple of days and for there to be the prospect of something in the waist plus range by the weekend. As noted yesterday, I’m off on a road trip to Vicco over the coming week, so stay tuned for remote status updates on local conditions along with the odd postcard. A strong high pressure system near New Zealand is maintaining a ridge towards New South Wales today, resulting in southeast to northeasterly winds in coastal areas. A cold front, currently south of the Bight, will skim across southeast Australia on Thursday, with an associated trough bringing a southerly change to waters south of about Newcastle. Behind this, a new high is expected to move over the Tasman Sea at the end of the week, and should remain dominant through the weekend. Another trough and southerly change are likely early in the new week. Variable about 10 knots becoming east to northeasterly 10 to 15 knots in the afternoon then shifting southerly 15 to 20 knots in the evening. Southerly 10 to 15 knots becoming southeasterly about 10 knots during the morning. Partly cloudy. The chance of a thunderstorm in the morning and afternoon. Posted on April 16th, 2019 in Dee Why. Posted on April 15th, 2019 in Dee Why. Posted on April 14th, 2019 in Dee Why. If you found waves yesterday, I’d go back for another look this morning because the data from the MHL buoy hasn’t budged. It’s still showing 0.9 m of SSE (151°) at 13 seconds. At Dee Why that means knee to waist high along the beach and at the point – with long waits. Tide is low at 1005 and then will be back to high at 1620. We had solid overcast skies and there was a prospect of a light shower as we head to the high of 23. Weather is set to be showery all week and the ocean is currently around 20C. Along with the showery weather, the surf outlook for the coming week is marginal to flat tomorrow and Tuesday before gradually building into the waist to chest high range by Friday. The most optimistic long range predictions are showing some potential for chest to shoulder high stuff at magnets on Saturday-Sunday. A high pressure system, currently near Tasmania, will move across the southern Tasman Sea from today onwards, maintaining a ridge into New South Wales for much of the week. South to southwesterly about 10 knots tending south to southeasterly 10 to 15 knots early in the morning, and reaching up to 20 knots in the early afternoon. Winds then decreasing to below 10 knots in the late evening. Below 1 metre, increasing to 1 to 1.5 metres during the morning, then decreasing below 1 metre by early evening. Partly cloudy. 80% chance of showers. The chance of a thunderstorm from late this morning. South to southeasterly about 10 knots. Posted on April 13th, 2019 in At large. A glittering, glassy sea along the beaches this morning as tiny, knee high lines rolled in from the south. There were people in the water from No Mans up to the life guard box at Longy, but it wasn’t super crowded. Around at the Collaroy-Narrabeen stretch the only surfable bumps were at the north end. Again, size was struggling to get much above knee high. Tide was dropping to the low at 0855 and there wasn’t a breath of wind. The 0500 MHL buoy data was indicating 0.9 metres at 12 seconds from the south (162°) – so down a touch from yesterday. Water is currently 21C and today’s high is expected to hit 26C. Tomorrow it’s expected to cloud up and be a bit cooler. Swell outlook is for the extra tiny conditions to continue through to about midweek when it could come up a touch into the waist high range. The ECM model shows the size creeping up toward the chest plus range by next weekend. Have yourself a great Saturday! A high pressure system over the western Tasman Sea extends a ridge along the New South Wales coast, while a broad trough lies over the state’s west. The high is expected to gradually weaken today as a cold front passes to the south. A new and stronger high is forecast to move across the southern Tasman Sea from Sunday onwards, maintaining a ridge into New South Wales for much of the coming week. South to southeasterly 10 to 15 knots tending east to southeasterly below 10 knots during the morning. Posted on April 12th, 2019 in Dee Why. Looks like surfing is going to be a challenge this morning. Conditions range from absolutely flat at south Narrabeen to ankle to knee high at Dee Why. It’s glassy though! Wind was light SW under high overcast skies and the MHL buoy’s 0600 showed a metre at 13 seconds from the south. Low tide was at 0750 and will be back to high at 1445. Water quality should be good everywhere. A high pressure system over the western Tasman Sea extends a ridge along the New South Wales coast, while a broad trough lies over the state’s west. The high is expected to gradually weaken today and Saturday as a cold front passes to the south. A new and stronger high is forecast to move across the southern Tasman Sea from Sunday onwards, maintaining a ridge into New South Wales for much of the coming week. South to southeasterly about 10 knots becoming east to northeasterly in the afternoon. Southerly 15 to 20 knots decreasing to about 10 knots during the evening. Below 1 metre, increasing to 1 to 1.5 metres during the morning. Posted on April 11th, 2019 in Goat's Forecast. Posted on April 11th, 2019 in Dee Why. The odd light shower passing by at 0700 this morning when I had my first look at the conditions for the day ahead. Dee Why was lightly populated; a couple of folks at the point, a few on SUPs patrolling around and several people up the beach toward No Mans. Size looked to be in the knee to waist range and it didn’t seem to be too consistent. A low key start to Thursday in other words. Wind down at North Head was out of the west at 6-7 kts and out at sea the MHL buoy was seeing 1.4 metres from 155° at 9 seconds apart as of 0600. Next tide is a 1.3m high at 1240. Weahter should be partly cloudy with a chance of a shower out on the coast as we head to a high of 21C – which is the same as the sea temperature at the moment. Beachwatch is showing pretty much everywhere as having good water quality. 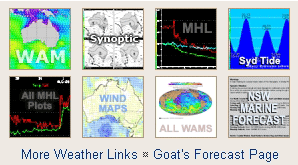 I’m not too excited about this morning’s swell forecast models, so I’m keeping my fingers crossed for the Goat’s call latter today. From my reading we’re in for very small to near flat conditions through the weekend and beyond. A high pressure system moving over southeast Australia today is pushing a ridge along the New South Wales coast, while a trough lies over the state’s west. The high is expected to reach the Tasman Sea by Friday, after which time it will gradually weaken as a cold front passes to the south. A new, stronger high is forecast to move across the southern Tasman Sea from Sunday onwards. Southerly 10 to 15 knots. North to northwesterly about 10 knots tending north to northeasterly 10 to 15 knots during the morning. Posted on April 10th, 2019 in Dee Why. Looking pretty rough and ready this morning at Dee Why. Wind is still southerly and was 12-20 kts at 0630 when I grabbed the snaps of Dee Why. As you can see, it’s not booming, and the surface conditions make the waist high waves less than inviting. Swell is coming from the south and NNE with the former dominating. Out at sea it’s 2.8 metres at 10-seconds apart. Tide was low at 0540 and is now coming into a moderate 1.37m high at 1140. It should be sunny today as we head toward an atumnal 21C high. Water is sitting on 21C. From the shape of the forecasts, it would seem that our swell is peaking right now and by this time tomorrow it will be smaller and closer together. The southerly will still be going through Thursday morning. It should fade overnight so that surface conditions are better for Friday morning – when, unfortunately, it looks as though the swell will be very small to flat. Right now next week is shaping to be marginal at best. Have a top old Wednesday everybody! A cold front that crossed the region yesterday has left fresh to strong southerly winds in its wake. These winds are expected to ease today and Thursday as a high pressure system moves over the Tasman Sea from the west, and extends a ridge along the New South Wales coast. Southerly 15 to 20 knots. Southerly 1.5 to 2.5 metres, decreasing to 1 to 1.5 metres during the afternoon. Northeasterly 1 to 1.5 metres, tending easterly around 1 metre during the afternoon. Southerly 15 to 20 knots decreasing to about 10 knots in the late evening. 1 to 1.5 metres, decreasing below 1 metre by early evening. Variable about 10 knots becoming northeasterly 10 to 15 knots during the evening.